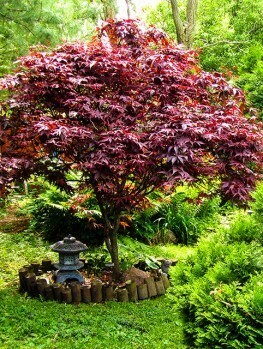 Japanese maples are greatly desired additions to the garden that bring a touch of quality as well as beauty. An outstanding and special one is the Coral Japanese Maple. This beautiful small tree is a joy all year. In spring the leaves are yellow-green, edged in red, turning bright-green as they develop. In fall they become a gorgeous golden-yellow, before falling to reveal bark of a stunning coral-pink that will brighten any garden all winter long. 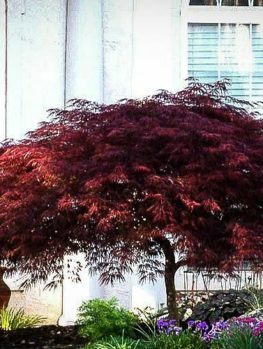 Even if you garden is too small, or you have no garden at all, the Coral Japanese Maple can be grown in a container and will grace any deck or patio with its all-year-round beauty. The coral-colored winter bark is a special and unique feature of this tree, making it highly desirable and coveted. Japanese Maples are the elite plants of the garden – their intense beauty and charm increases with every passing year and venerable old specimens are irreplaceable (and very valuable) features in the best mature gardens. There are literally hundreds of different varieties of Maples, but the Coral Japanese Maple stands out for its exceptional beauty, especially in winter when the luminous coral-pink of the twigs lifts the gloomiest day and brings beauty to the sleeping garden. 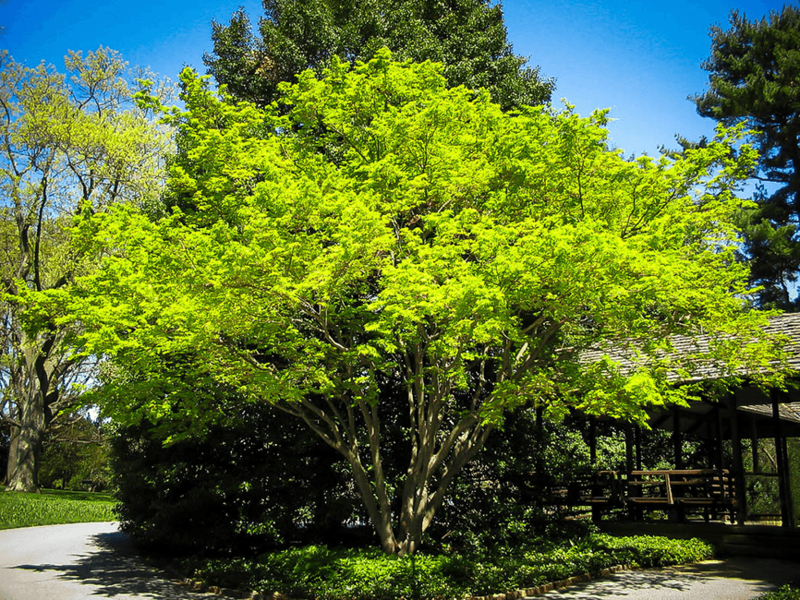 This tree is also one of the faster growing Japanese Maples, so it will not be too long before your Coral Japanese Maple is a substantial plant of beauty in your garden. 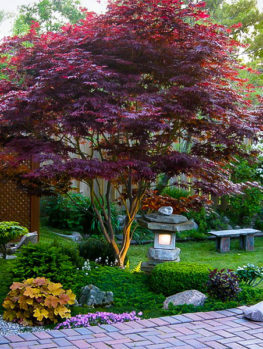 People tend to think they need a Japanese-style garden to grow Japanese Maples, but this is not true. Their graceful beauty fits well into any style of garden and they are wonderful additions to a shady garden to accompany azaleas, hydrangeas and rhododendrons. 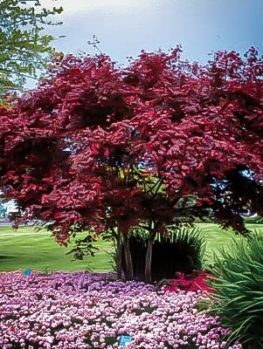 The Coral Japanese Maple makes a lovely lawn specimen in a small garden, it blends well into beds along the edge of wooded areas and it is also magnificent in a suitable large pot as a patio or terrace specimen. Even if you don’t have a garden at all, this tree is wonderful on a balcony too. Remember when choosing a spot for your tree that the winter twig color is the most important feature of the Coral Japanese Maple, so try to find a spot where it can be seen from indoors during the coldest weather. 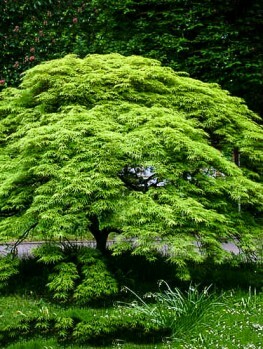 The Coral Japanese Maple will grow at a moderate rate into a tree 20 feet tall or even more. It is an upright tree that will have an eventual spread of 5 to 8 feet. If you are looking for a cascading tree, the Mist Japanese Maple is a spectacular choice. The young bark becomes a brilliant coral-pink color by the end of summer and all through the winter months. In spring the new leaves emerge a yellow-green color with red edges, turning neon-green for the summer and then golden-yellow in fall. The leaves are like a tiny hand with 5 to 7 narrow lobes and the leaf is around 2 inches long. 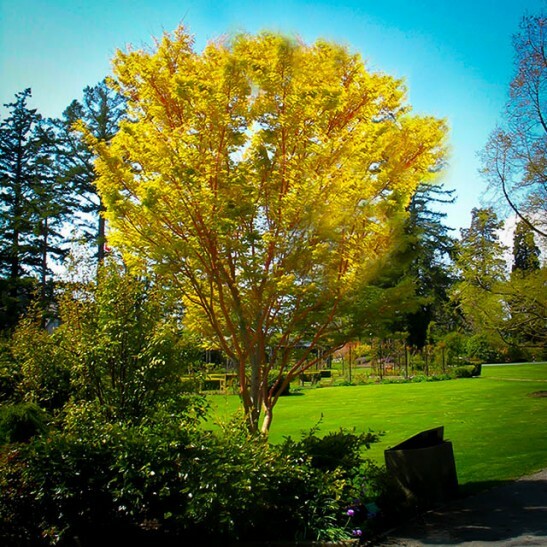 Japanese Maples are hardy in zones 5 to 8, so anywhere that is not too cold but has some winter weather is a possible location for these beautiful trees. They grow best in a well-drained, slightly sandy soil enriched with organic material, but they will also grow in other soils, including clay, as long as it does not stay constantly wet. The best location is a place where the tree receives some morning sun but is lightly shaded in the afternoons during the summer months. They have no significant pests or diseases and the main issue for these trees is late frost in spring. They begin to leaf-out very early, so watch the weather forecast and if a frost is expected, cover your tree. A string of lights left on underneath a couple of layers of burlap will provide excellent frost protection. 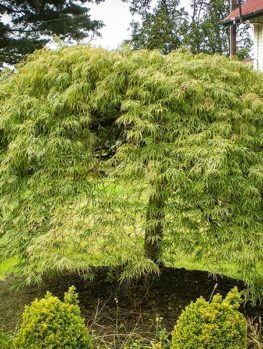 Some weaker kinds of Japanese Maples can be killed by these frosts, but once established the Coral Japanese Maple will simply produce a new set of leaves if it is affected by an occasional late frost. Trees in containers can of course be simply moved into a cool place like a garage if frost is forecast, but they cannot be grown permanently indoors. 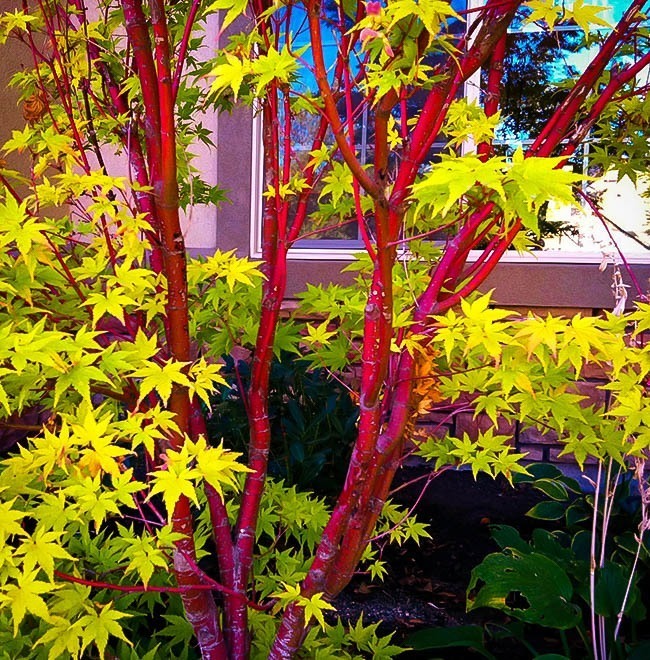 The Coral Japanese Maple is correctly known as Acer palmatum ‘Sango-Kaku’, which means ‘coral tower’ in Japanese. Its origins in Japan are ancient but it seems to have been introduced into both England and Ireland in the 1920’s and from there soon after brought to America. The wild Japanese Maple grows across Japan and Korea and even these natural plants show a lot of variations in leaves and bark. These differences were noticed by Japanese gardeners centuries ago and thousands of different forms were collected, developed and cherished. 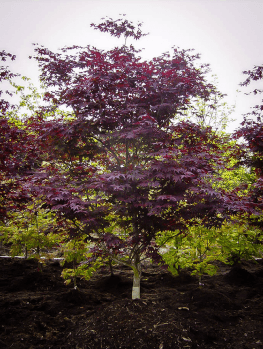 With so many different varieties of Japanese Maples, it is very important that they are produced correctly to ensure they have all the special characteristics of the particular variety. 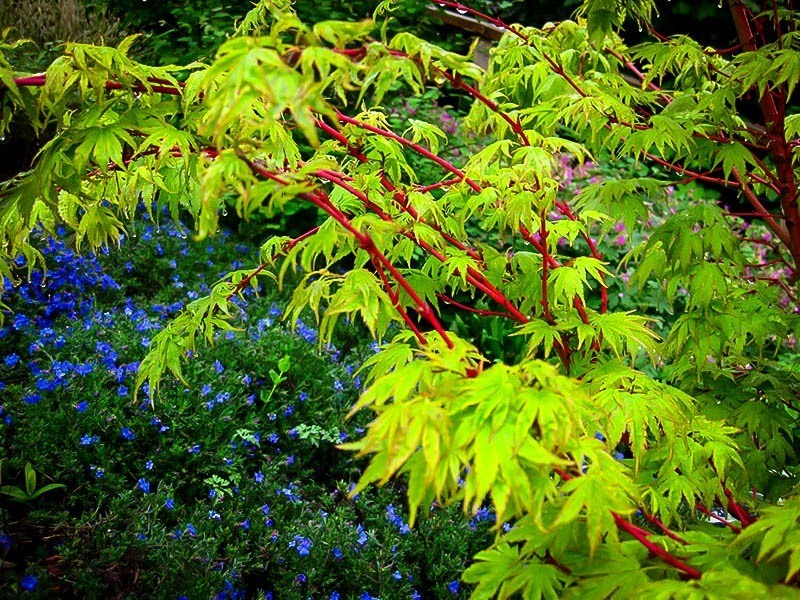 Our Coral Japanese Maples are grown the correct way, by grafting stem pieces onto roots of wild seedling trees. This process takes a lot of skill and time for the trees to grow, but it is the only way to be sure the tree will have the right features. Beware of cheap seedling trees that will certainly lack the intense bark-color of this tree and will not be the spectacular plant you are expecting. 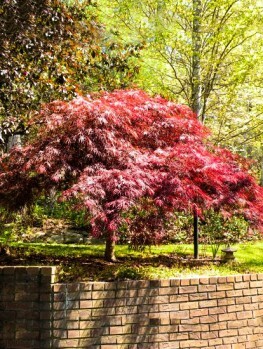 To plant your Coral Japanese Maple, dig plenty of rich organic material, like rotted manure, garden compost, rotted leaves or peat-moss into the soil. Plant your tree at the same depth it is in the pot in a hole that is three times wider than the pot. Replace most of the soil and firm it gently around the roots. Water thoroughly and when all the water has drained away replace the rest of the soil. To grow the Coral Japanese Maple in a pot, choose a large pot with drainage holes and use a regular outdoor potting soil. Keep your potted tree well-watered, but allow it to dry a little between each watering. Do not stand the pot in a saucer full of water. Water your tree regularly, especially in summer. A good deep soak once a week is much better than frequent sprinkles, and make sure to soak the soil in the root-zone, not just around the trunk of the tree. Keep a thick layer of organic material over the roots, replacing it as necessary with fresh material. Pruning is not necessary – just allow your tree to grow naturally.